Art, Now on your iPhone. Ever since Apple launched those wicked little devices called the iPhone and the iPod Touch, we knew it'd be a fantastic place to display art. We couldn't wait to take what was already wicked, and make it a little devious too. 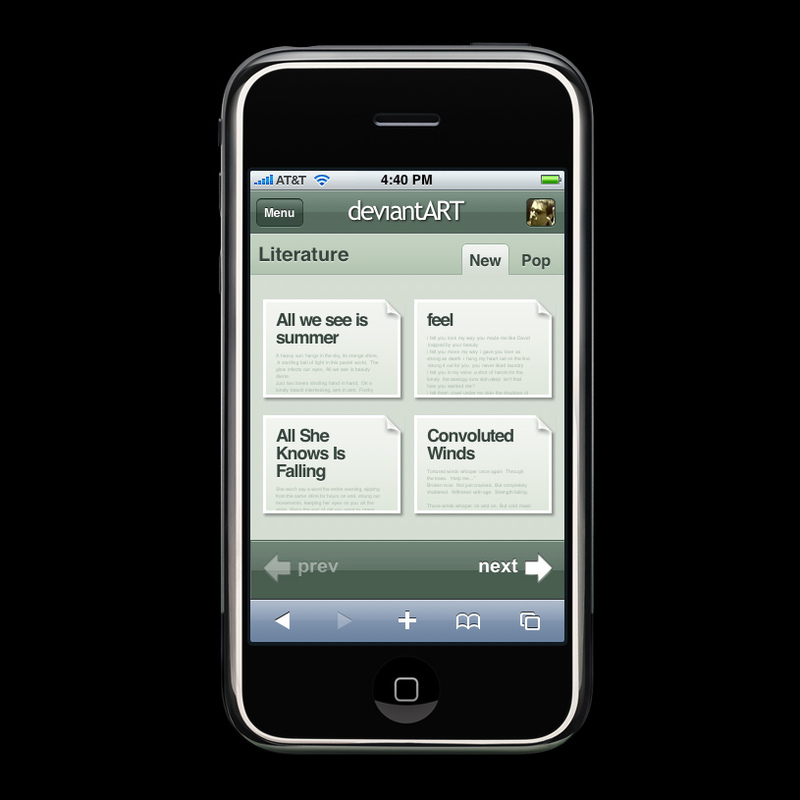 Fast forward a few months and today we're proud to announce deviantART for the iPhone and the iPod Touch! 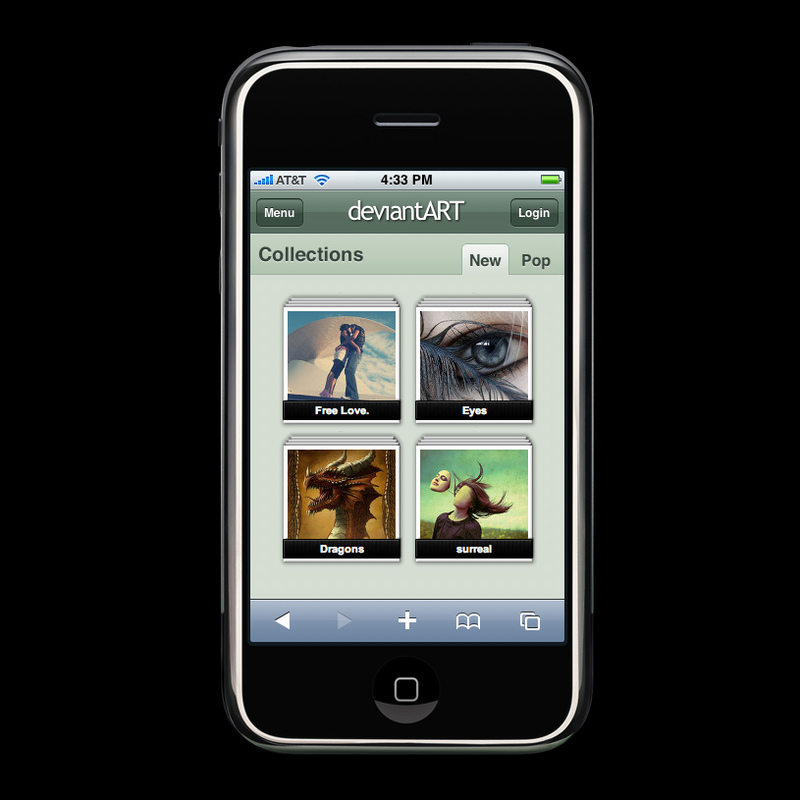 Thanks to our incredible team of developers and designers, deviantART has been optimized to bring you the best hand-held mobile experience possible. Your favorite art, films, literature and collections are now browsable from the palm of your hand, any time, anywhere. 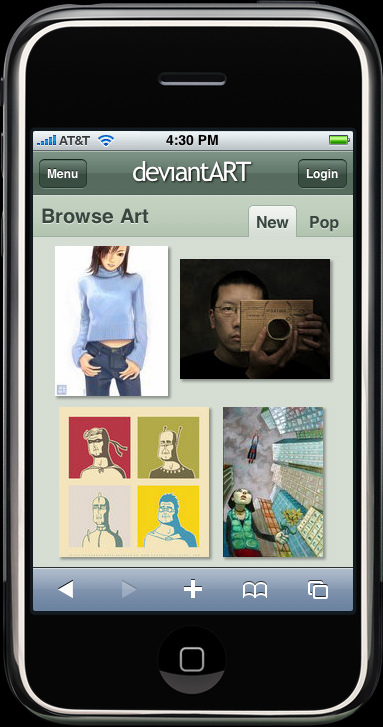 Simply pick up your iPhone or iPod Touch and visit deviantART.com, and you'll automatically be treated to our fantastic new interface. This isn't the end of our work for this interface, either. Expect newer versions to include the new message center (when it launches) Forums, News and more. 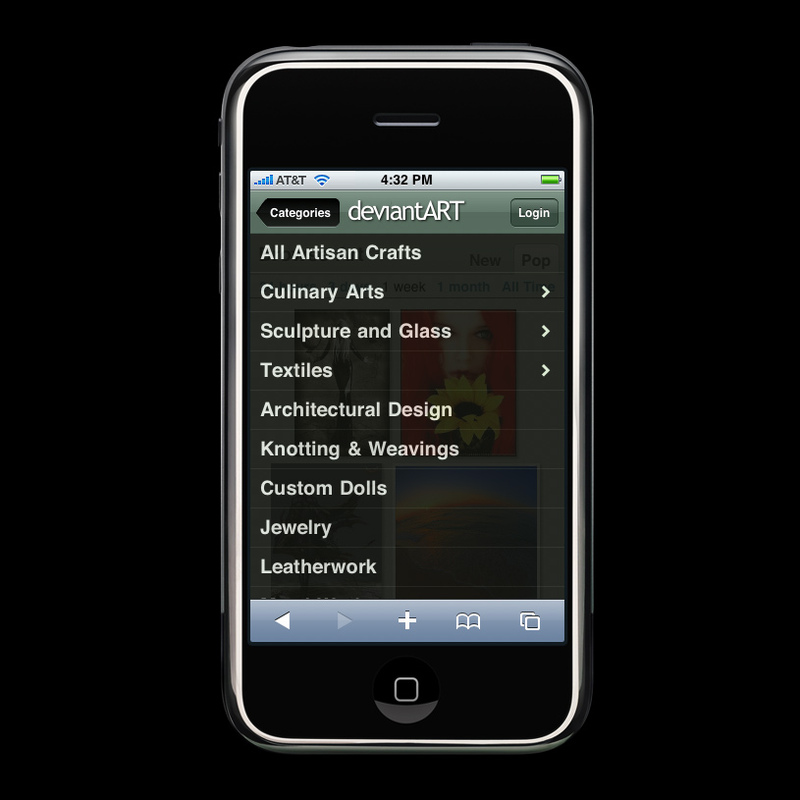 Now you can enjoy artwork on the go in a fast and intuitive interface that is just as fun as it is easy to use. We've found that mobile deviantART brings art to every conversation wherever you are. Next time someone says, “Hey how about we go see llamas at the zoo!” you can very easily search deviantART's vivid database of beautiful artworks to illustrate any discussion! How do i make an id pic And put it <there cuz im A bit sick of that smily face staring at me plz reply at ME bro. I can't even login when I get to the site on my ipod. I go through the steps, but the login won't take. You can't change your profile picture! But you CAN'T upload pictures! this is all good and fine but are there any deviantart apps? Apps seem to be better than mobile sites, from what I've experienced! I hav an iPod touch. How do I customize my profile and watch other ppl? Umm it's ok but how do I add friends?? You simply can't or you Gus have made it too hard to figure out. Other than that Im very happy this was made! How do you favourite a deviation on a ipod touch?? ?please help!! i have this problem with deviantart on my ipod touch. i'll come on the website and i'll try to go on a certain collection and when its halfway through loading the collection, it;ll exit out of the safari. Please help. Ok when I am browsing the art and I see something cool I enlarge it to see the details, but when I hit the back button it takes me all the way back and I have to skip over like 12 pages just so i can continue where I left off. Is there a way around this? It worked on my itouch as mobile before but now it won't because I manually changed it to the regular website. How do I change it back? About your request, if you want to change the regular website to the iPhone version, you must clear all the cookies of your iPhone/iPod Touch. Good job to the DeviantART team! I turned off the mobile version on my ipod touch, does anyone know how to get back to it? need to get chat on there!!!! have you considered making an app for DA? For anyone that wants to create art with the touch or phone, use the free app "Colors! Lite", and there is also a upgrade version. There is some wonderful art that has been done with this application, and you can watch a playback of how it was created right on the touch! It may be a silly question but where can I download it? One thing though, needs to have a chatroom interface! I want to chat still but can't because of the plugIn. Do you think that could be possible? I have a question, is there any way to get the interface back onto my iphone after I've disabled it? Please help with this. I have the same problem. Tried going to dA homepage, and clear the cookies and still didn't work. Does anybody here know how to get this back. I asked the person who posted this new article, got it back. I love this! But not many ppl put on QUICKTIME animations because the iphone can't do flash. Where's the dropdown menu? I'm on my itouch right now and it dosn't show up anymore and I want to disable the mobile interface. Art, Now on your iPhone and iPod Touch Art, Now on your iPhone.